. 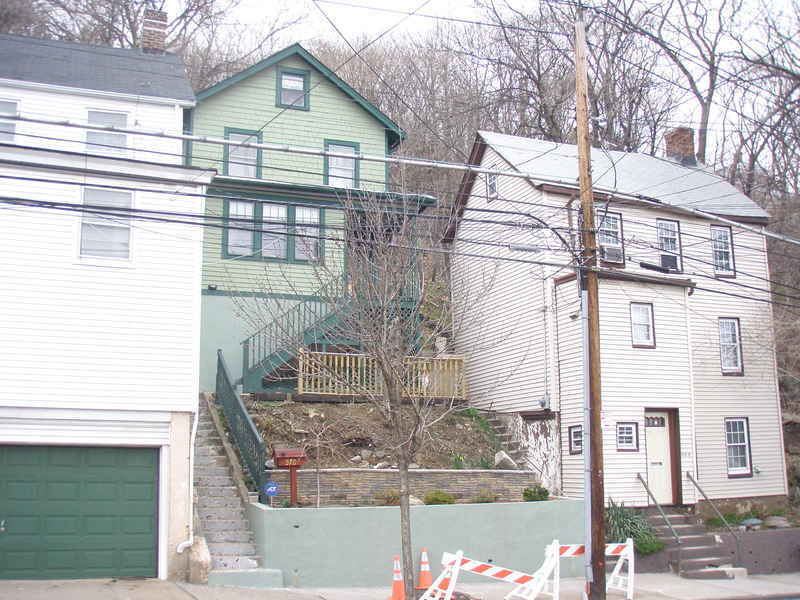 . . Or so these hillside houses on Van Duzer Street in Stapleton Heights--just south of the point at which it meets the last stretch of St. Paul's Avenue--seemed to me when I photographed them not long ago on one of my first extended walks of the 2008 spring/summer season. 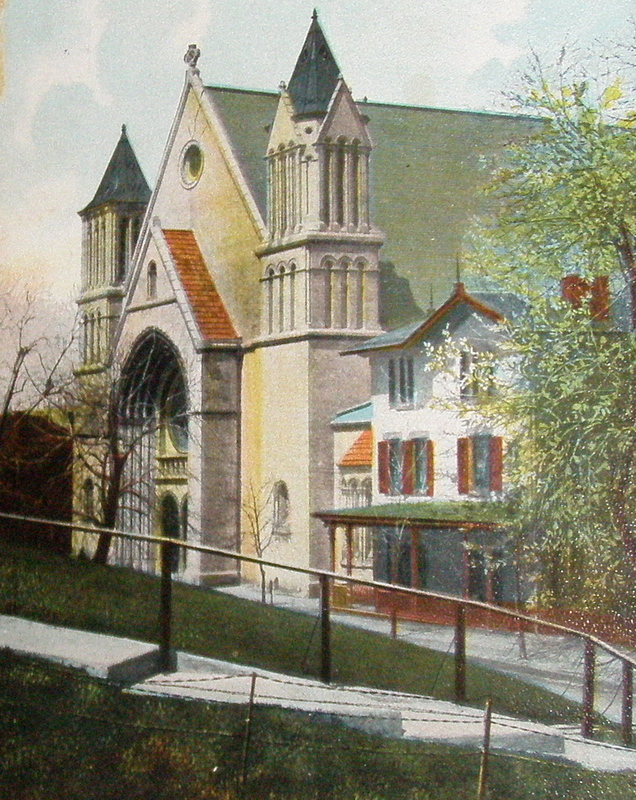 About a 15-minute bus ride from the ferry and about an hour from downtown Manhattan, this group of houses appears to have been assembled randomly during the mid- to late 19th century and into the early 20th. 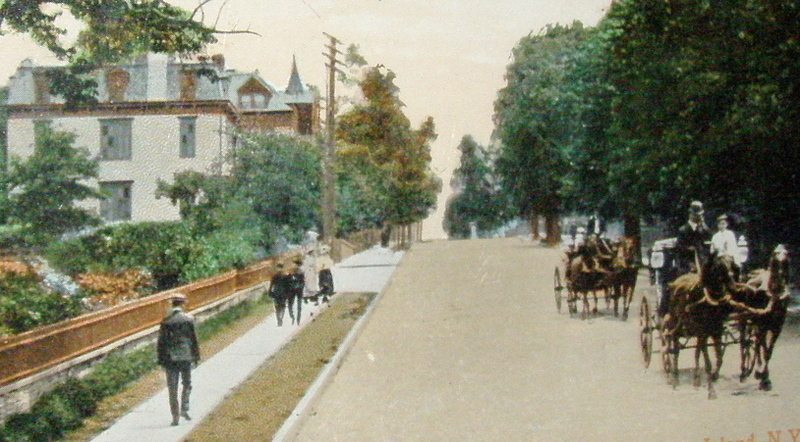 The question is why, at the turn of the last century, when there was hardly a shortage of buildable land in Richmond County, a group of families chose to settle in this steep hillside cluster, some of which was accessible only via a steep and irregular hillside stair. LATER TODAY, Thursday, January 24, 2008, the New York City Traffic Congestion Mitigation Commission will hold hearings in each of the 'outer' boroughs on five plans designed to reduce vehicular congestion in Manhattan's Central Business District while generating revenue for major mass transit improvements citywide. I have submitted to the Commission written testimony about the plans, which appears later in this entry. First I supported Mayor Bloomberg's original Congestion Pricing plan and testified in favor of it at a hearing of the New York City Traffic Congestion Mitigation Commission (TCMC) late last fall. But even as one of the plan's ardent supporters, I had to admit it sounded awfully complicated and seemed pretty expensive just to implement. Then I thought I liked the sound of tolling the East River bridges--a simpler means of discouraging private car commuting into Manhattan's Central Business District. Not only was the bridge tolling plan projected to yield greater income than the mayor's plan; it was also projected to yield greater reductions in traffic congestion as well. But like the original, this plan had some serious flaws. The bridge-tolling plan charges for all trips into and out of Manhattan all the time. So it cannot distinguish between trips when traffic is light from trips that occur when congestion is heaviest. And it fails to charge for trips that start and end within Manhattan, where congestion is greatest. Further, how ever unintentionally, the bridge-tolling plan tends to penalize particular classes of drivers and particular locations, some of them small commercial vehicle operators and many of them low- and moderate-income motorists, disproportionately from Upper Manhattan and the Bronx. Of the three remaining plans being considered by the Commission, one fails to reduce traffic congestion adequately; the other fails to generate income for mass transit improvements. So neither of these can be considered viable. The remaining proposal, called The Alternative Congestion Pricing Plan, is a streamlining of the mayor's original PlaNYC proposal with significantly lower capital and operating costs. It also satisfies the revenue and traffic reduction mandates upon which funding by the Federal Department of Transportation depends. I appreciate the opportunity to share my views on this important topic. My name is Dan Icolari. I'm a 30-year resident of Staten Island; the founder of Walking is Transportation.com and a co-founder of the St. George Civic Association and the Preservation League of Staten Island. I've served on Community Board 1 and am a member of numerous Staten Island civic and cultural organizations. problem with potentially life-threatening consequences for our city. lower cost and greater ease of implementation. I believe these attributes offset the alternative plan's various weaknesses, as enumerated by the Commissioners in their interim report. AS THE RETAINING WALL CRUMBLES . . . I had passed the forlorn stretch of Victory Boulevard shown in the photo above countless times, and each time wondered: Where does that double stairway lead? 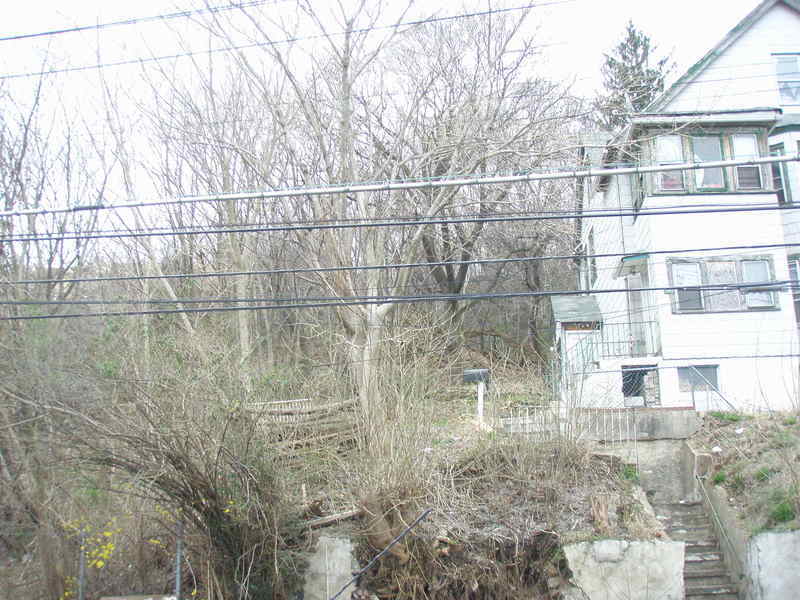 I speculated that the stairway might provide seldom-used access to a secondary street at the top. 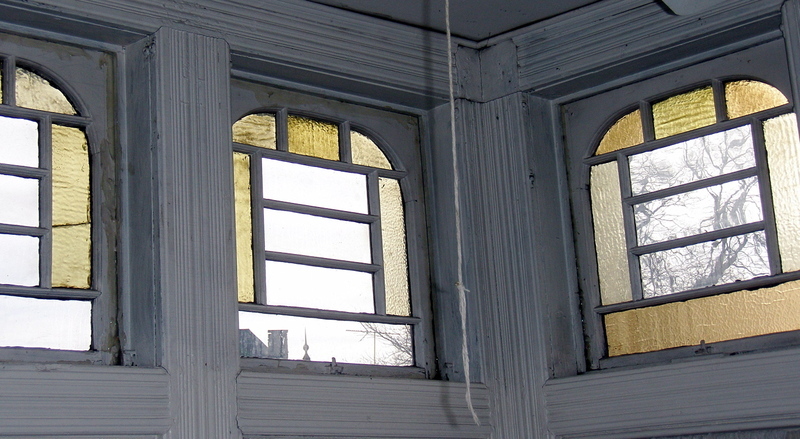 Or that there might be a grand old house up there, or the remains of one. But this time, unlike those other times, I didn't have to speculate. I was prepared not only to look for and find the answer, but to document it. I had a digital camera in my pocket, walking shoes on my feet, and time to spare. So, after I took the picture above, I crossed Victory Boulevard and made my way through the tangle of weeds and refuse to the stairway. 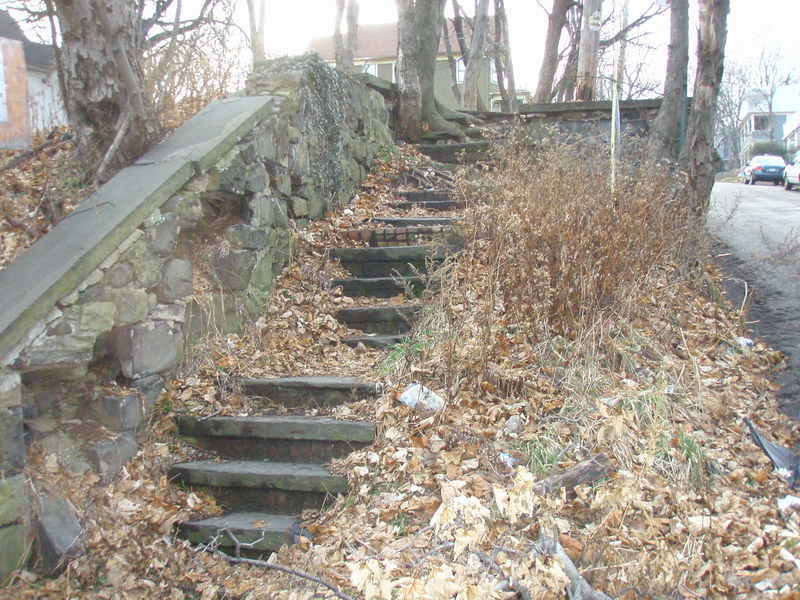 Both the concrete stairs and the cast-iron stair-rail were in surprisingly good condition. I took very firm, deliberate steps, both to establish the stability of each stair-tread and to attach myself as firmly as I could to each one. 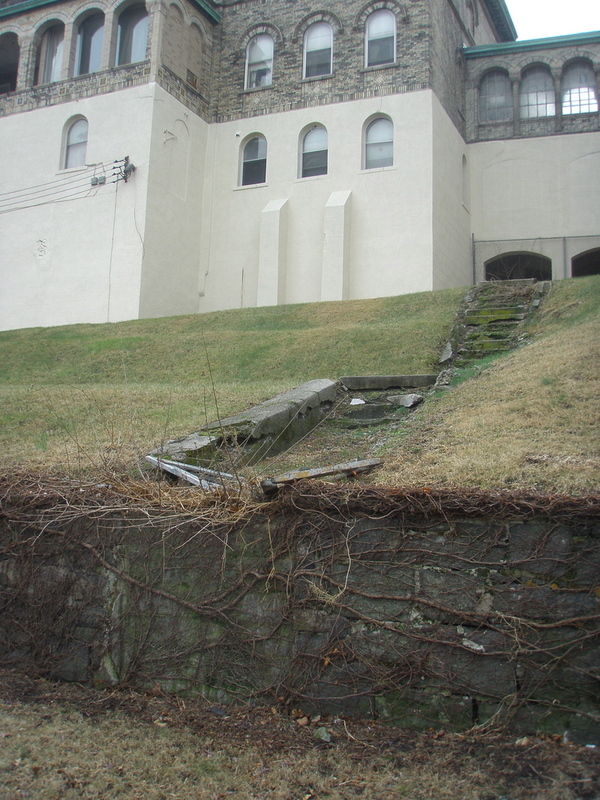 What I found when I reached the top of those stairs was a concrete sidewalk that extends, where it survives, to several other, narrower stairways to the west. This modest attempt at neighborhood-building suggests that two or more dwellings were at least planned, if not built, here. 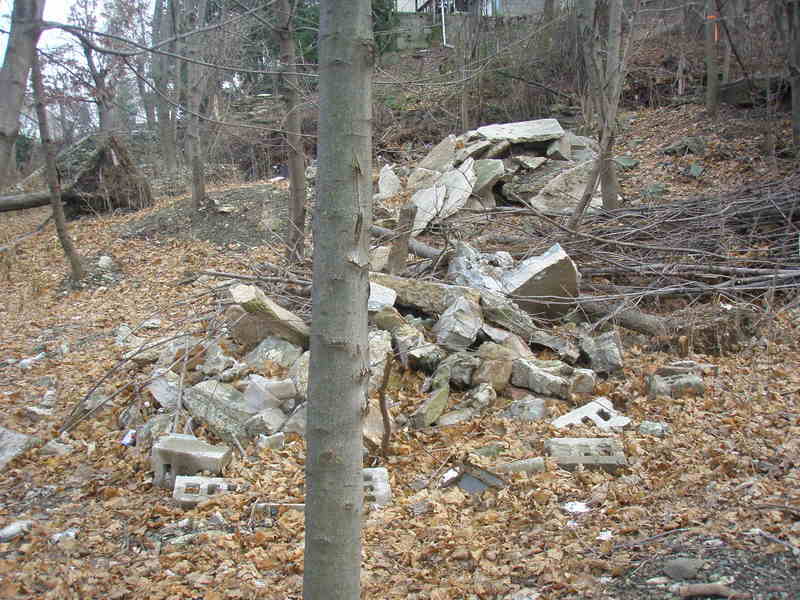 Other remnants--construction debris and piles of young maples--indicate that this harbor-view lot on a Ward Hill hillside has also been used as a dump. But how? Other than the stairs up from Victory Boulevard, there's no street access. Maybe somebody did somebody a favor through somebody's back yard. 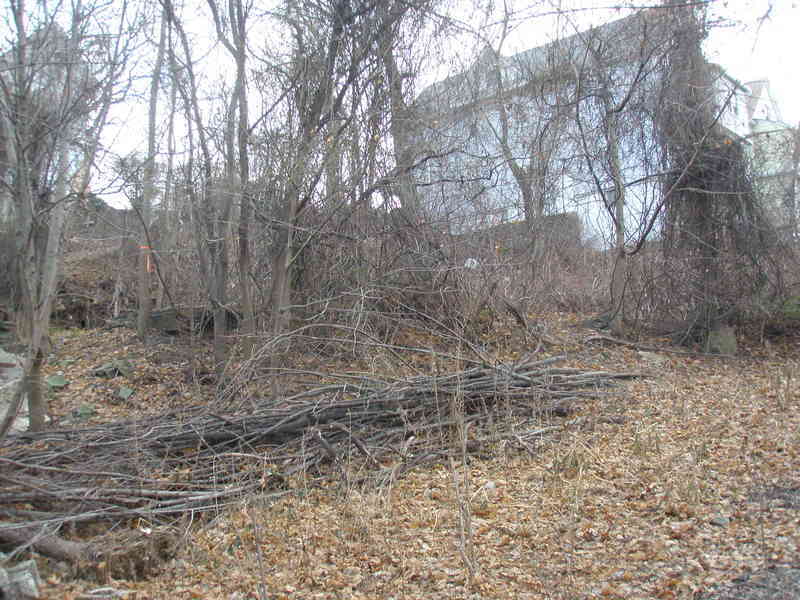 Until fairly recently, given Staten Island's plentiful supply of unimproved land, developers had little reason to pursue problem parcels such as this one, with its lack of vehicular street access. Once the current slump ends (and it will; I've lived through three since 1977), and given the increasing attractiveness of the St. George area as a safe, attractive and affordable place to live, it's likely developers will be more willing to seize whatever opportunities they can find, even if it means applying for a variance and meeting other requirements. In the end, compromises will be reached. Variances will be granted. Profits will be made. In the meantime, these Staircases To Nowhere in Particular molder on. I guess the collapsed plastic sawhorse-ends shown in the photo above are supposed to dissuade you from clambering up what remains of the stone stairs on the southwest corner of Scribner and Westervelt avenues, Tompkinsville. 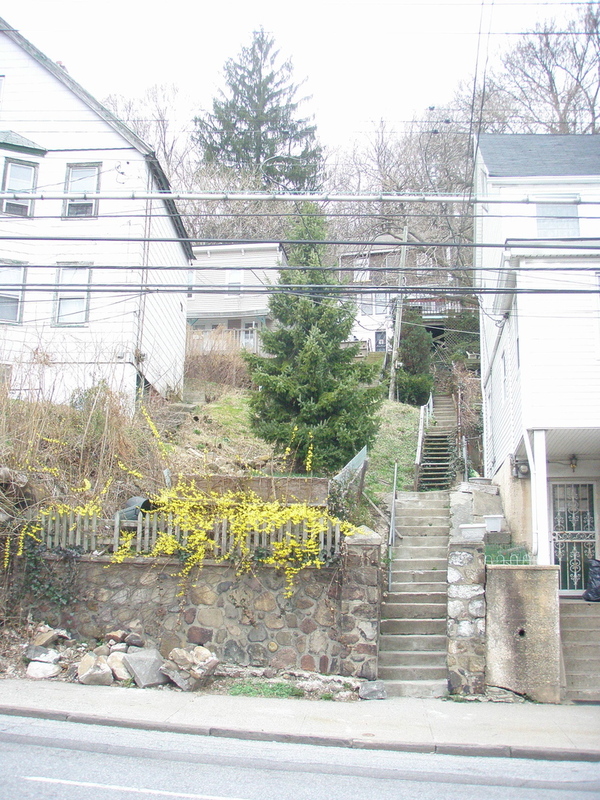 But as Scribner Avenue resident Richard Wonder wrote me, the stairs aren't as bad as they look. 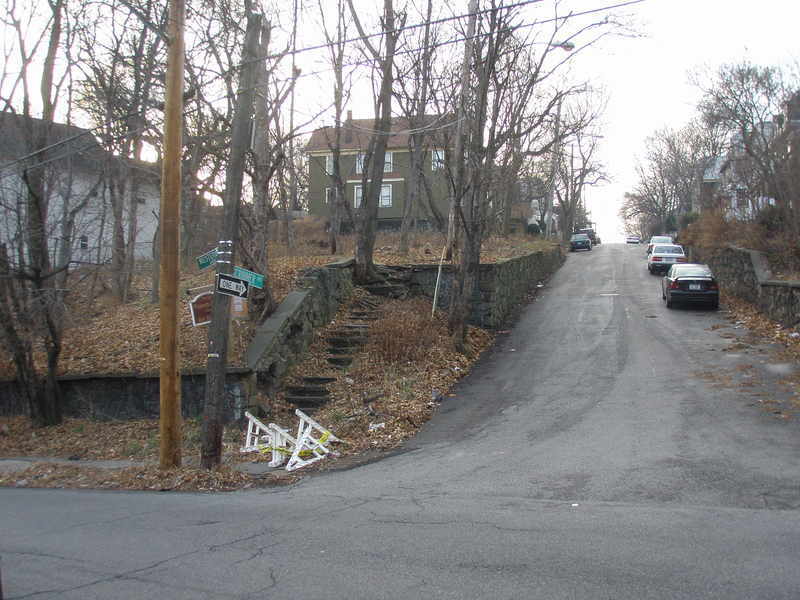 That's not to say, however, that the stairs should be permitted to deteriorate further--or that they should be replaced by some dreary lump of poured concrete, as on the south side of Corson Avenue at Westervelt, one block south. 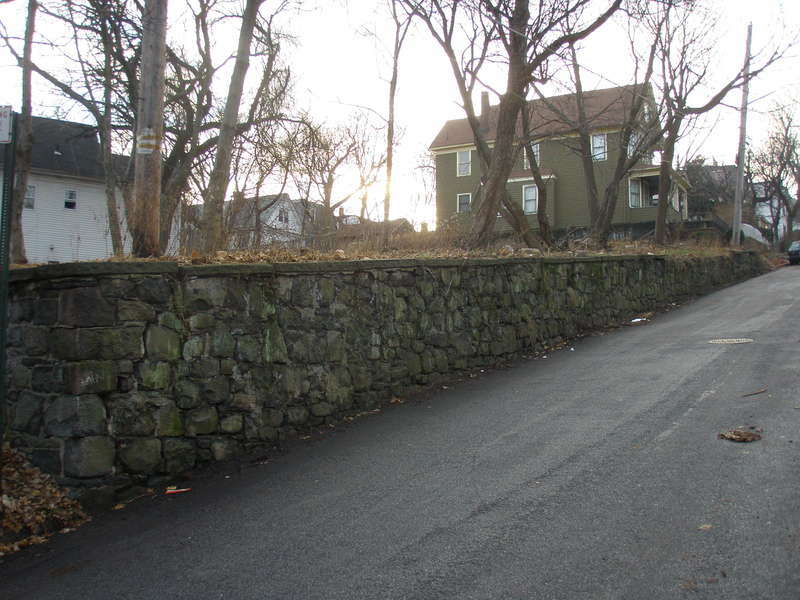 As the photo above shows, the retaining wall on the south side of the Scribner Avenue roadbed is solid and straight. What's not shown in that photo is the slate sidewalk laid above that retaining wall, which is perfectly serviceable as well. 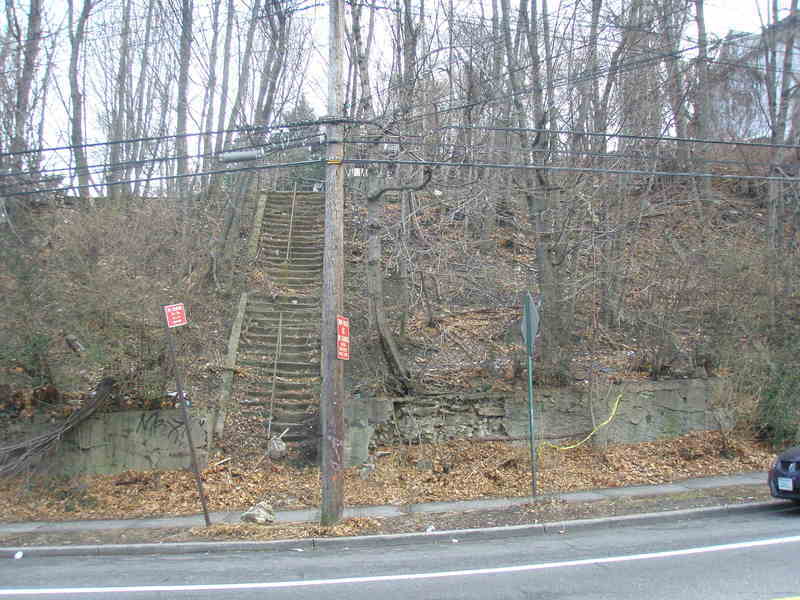 Like the stairways connecting York Avenue to Highview Avenue and York Terrace just a few blocks west (you'll find photos of them in the October, 2007 archive of this blog), these distinctive pedestrian paths are unique, not only on Staten Island, but in New York City. They deserve to be saved not only because they're charming and quaint but because they're sensible pedestrian amenities that could last another century with adequate investment now. 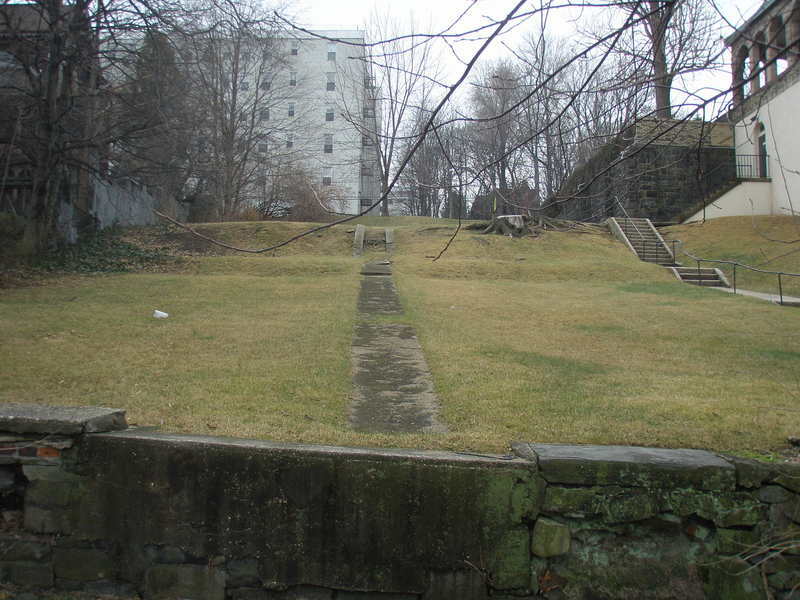 Situated at the front of a large, street-to-street property that faces New York harbor, the steps seen in the photo above lead to one of the very few surviving pre-Civil War buildings in St. George. 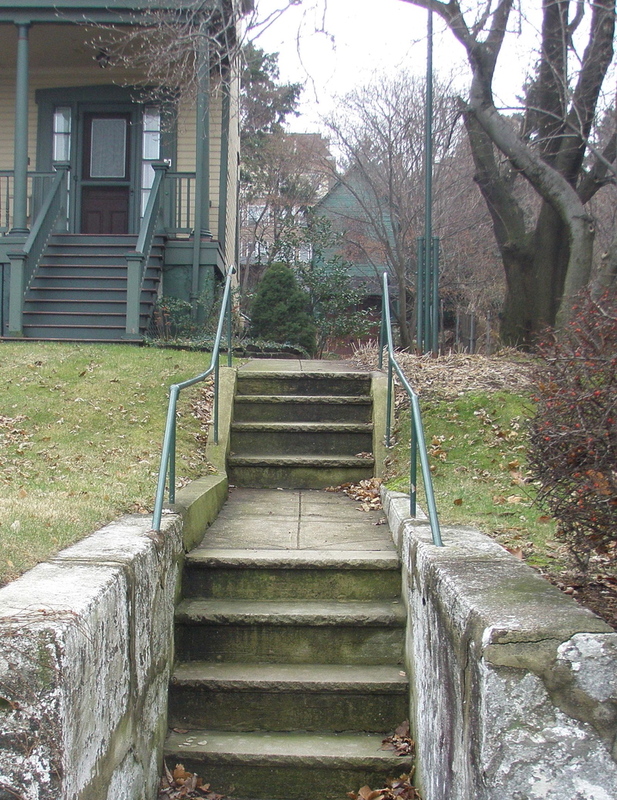 The path straight ahead, on the right side of the house, leads to a second set of exterior stairs, at the rear of the property, that ascend to the street above. 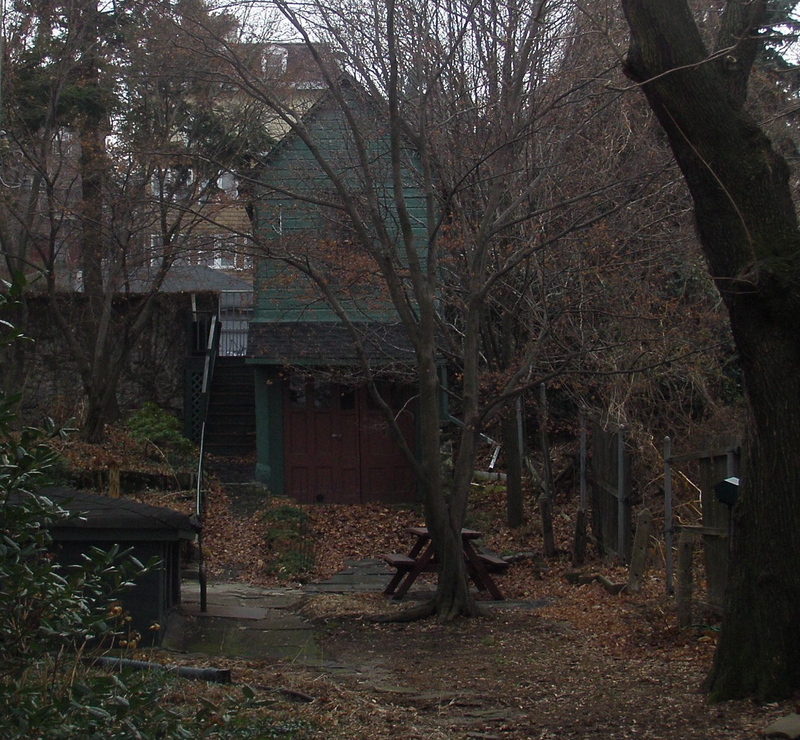 The odd little two-story outbuilding next to the right of those stairs is a garage at street level and a potting-shed at garden level. 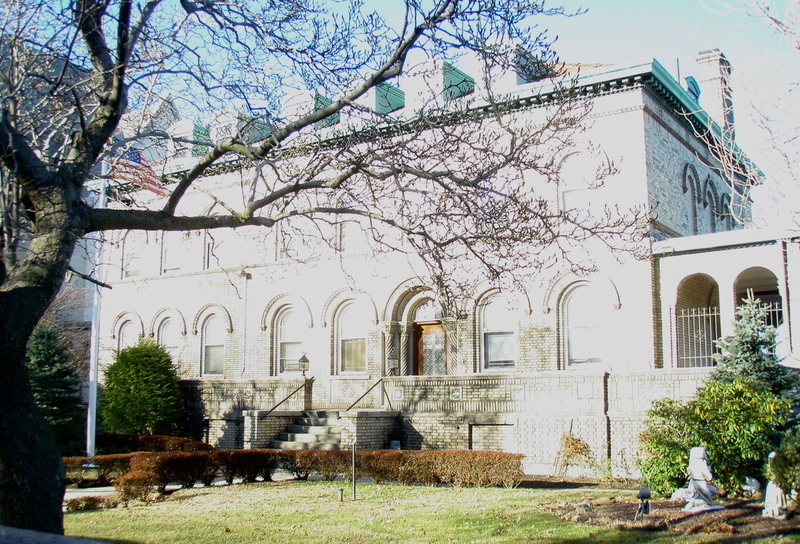 Fortunately, this property is protected as part of the St. George/New Brighton Historic District and cannot be altered or demolished without detailed review and approval by the New York City Landmarks Preservation Commission.